One of the big questions I’ve struggled with is the Darwinian premise that everything made itself out of nothing – with no design, no purpose, no external energy or plan. No god or designer or creator or whatever label you will apply to the external energy that made everything and set the rules. If Darwin and his followers are correct, the universe, everything, is nothing but an accident of random chance. Perhaps we are all here because mud was struck by lightning. My reluctance to accept the mud and lightning myth, stems from my reluctance to take the next logical step. When one accepts that we are all an accident, if all is random chance – then humans as a species are nothing special, and individuals are lesser still. We have no innate rights or freedoms except that which we give ourselves – either through agreement, or by the imposition of force. If there is no “god”, there can be no “right” or “wrong” except what we decide for ourselves as individuals or groups. Who is to say that your morality is wrong and mine is right? Me? You? The group? And it all stems from that great first question: Where did everything come from? But according to Mr. Stein, our friends at Cave Hill and academia in general don’t allow certain questions to be asked. Those who ask them are shunned and discredited. Can’t wait to see this movie. Check out the long trailer if you have some time. Well worth it. Can Polo Unite The Classes And The Races On Barbados? “It was all very exciting and my wife loved it, she now understands my passion – unfortunately an unexpected emergency pulled us away, otherwise I would have been down there quite late, lemme tell ya! I must add that unfortunately, there are still those out there who ban themselves from polo. I was at a watering hole a few weekends back when a young lady who is an indirect employee of Bizzy Williams was trying to get the crowd I was hanging with to view Waterhall action. One of the wags there made the claim that polo is only now opening to show foreigners how kind and sweet all Bajans does get along. When the reality is we couldn’t even find those same matches a few years back. She tried to rebut them, she even asked me if I went talking foolishness again about my article, when I had to remind her most of them don’t even know I do that on the side when I’m home! 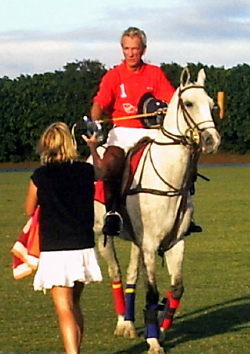 Ian Bourne is a big polo fan and lately he has been writing about some of the matches – but his articles aren’t really about polo, they are about all of us on this tiny rock. Has polo as a sport changed from being the exclusive preserve of the ultra rich like Bizzy and his pals? Perhaps not as much as the Piaget crowd would like to pretend, but the world do keep turnin ’bout hey.